1 A None No Power Seat 1 A is a standard First Class Suite with a flat bed. 1 D None No Power Seat 1 D is a standard First Class Suite with a flat bed. 1 E None No Power Seat 1 E is a standard First Class Suite with a flat bed. 1 J None No Power Seat 1 J is a standard First Class Suite with a flat bed. 11 A None No Power Seat 11 A is a standard Prestige Class flat bed seat whose proximity to the lavatory and galleys may be bothersome. 11 B None No Power Seat 11 B is a standard Prestige Class flat bed seat whose proximity to the lavatory and galleys may be bothersome. 11 D None No Power Seat 11 D is a standard Prestige Class flat bed seat whose proximity to the lavatory and galleys may be bothersome. 11 E None No Power Seat 11 E is a standard Prestige Class flat bed seat whose proximity to the lavatory and galleys may be bothersome. 11 G None No Power Seat 11 G is a standard Prestige Class flat bed seat whose proximity to the lavatory and galleys may be bothersome. 11 H None No Power Seat 11 H is a standard Prestige Class flat bed seat whose proximity to the lavatory and galleys may be bothersome. 17 A None No Power Seat 17 A is a standard Prestige Class flat bed seat. 17 H None No Power Seat 17 H is a standard Prestige Class flat bed seat. 2 A None No Power Seat 2 A is a standard First Class Suite with a flat bed. 2 D None No Power Seat 2 D is a standard First Class Suite with a flat bed. 2 E None No Power Seat 2 E is a standard First Class Suite with a flat bed. 2 J None No Power Seat 2 J is a standard First Class Suite with a flat bed. 20 A None No Power Seat 20 A is a standard Prestige Class flat bed seat with plenty of extra legroom due to the exit row. 20 B None No Power Seat 20 B is a standard Prestige Class flat bed seat with plenty of extra legroom due to the exit row. 20 D None No Power Seat 20 D is a standard Prestige Class flat bed seat with plenty of extra legroom due to the exit row. 20 E None No Power Seat 20 E is a standard Prestige Class flat bed seat with plenty of extra legroom due to the exit row. 20 G None No Power Seat 20 G is a standard Prestige Class flat bed seat with plenty of extra legroom due to the exit row. 20 H None No Power Seat 20 H is a standard Prestige Class flat bed seat with plenty of extra legroom due to the exit row. 23 A None No Power Seat 23 A is a standard Prestige Class flat bed seat whose proximity to the lavatories, bar and galley may be bothersome. 23 B None No Power Seat 23 B is a standard Prestige Class flat bed seat whose proximity to the lavatories, bar and galley may be bothersome. 23 D None No Power Seat 23 D is a standard Prestige Class flat bed seat whose proximity to the lavatories, bar and galley may be bothersome. 23 E None No Power Seat 23 E is a standard Prestige Class flat bed seat whose proximity to the lavatories, bar and galley may be bothersome. 23 G None No Power Seat 23 G is a standard Prestige Class flat bed seat whose proximity to the lavatories, bar and galley may be bothersome. 23 H None No Power Seat 23 H is a standard Prestige Class flat bed seat whose proximity to the lavatories, bar and galley may be bothersome. 28 A None No Power Seat 28 A is a standard Economy Class seat that has extra legroom due to the position of the bulkhead, however proximity to the lavatory and galleys may be bothersome. The tray table is in the armrest, making the armrest immovable and slightly reducing the seat width. There is no floor storage during takeoff and landing. This is a bassinet position, so passengers with infants are often seated here. 28 B None No Power Seat 28 B is a standard Economy Class seat that has extra legroom due to the position of the bulkhead, however proximity to the lavatory and galleys may be bothersome. The tray table is in the armrest, making the armrest immovable and slightly reducing the seat width. There is no floor storage during takeoff and landing. This is a bassinet position, so passengers with infants are often seated here. 28 C None No Power Seat 28 C is a standard Economy Class seat that has extra legroom due to the position of the bulkhead, however proximity to the lavatory and galleys may be bothersome. The tray table is in the armrest, making the armrest immovable and slightly reducing the seat width. There is no floor storage during takeoff and landing. This is a bassinet position, so passengers with infants are often seated here. 29 C None No Power Seat 29 C is a standard Economy Class seat however, the proximity to the lavatory and galleys may be bothersome. 3 A None No Power Seat 3 A is a standard First Class Suite with a flat bed. 3 D None No Power Seat 3 D is a standard First Class Suite with a flat bed. 3 E None No Power Seat 3 E is a standard First Class Suite with a flat bed. 3 J None No Power Seat 3 J is a standard First Class Suite with a flat bed. 30 D None No Power Seat 30 D is a standard Economy Class seat that has extra legroom due to the position of the bulkhead, however proximity to the lavatory and galleys may be bothersome. The tray table is in the armrest, making the armrest immovable and slightly reducing the seat width. There is no floor storage during takeoff and landing. This is a bassinet position, so passengers with infants are often seated here. 30 E None No Power Seat 30 E is a standard Economy Class seat that has extra legroom due to the position of the bulkhead, however proximity to the lavatory and galleys may be bothersome. The tray table is in the armrest, making the armrest immovable and slightly reducing the seat width. There is no floor storage during takeoff and landing. This is a bassinet position, so passengers with infants are often seated here. 30 F None No Power Seat 30 F is a standard Economy Class seat that has extra legroom due to the position of the bulkhead, however proximity to the lavatory and galleys may be bothersome. The tray table is in the armrest, making the armrest immovable and slightly reducing the seat width. There is no floor storage during takeoff and landing. This is a bassinet position, so passengers with infants are often seated here. 30 G None No Power Seat 30 G is a standard Economy Class seat that has extra legroom due to the position of the bulkhead, however proximity to the lavatory and galleys may be bothersome. The tray table is in the armrest, making the armrest immovable and slightly reducing the seat width. There is no floor storage during takeoff and landing. This is a bassinet position, so passengers with infants are often seated here. 30 H None No Power Seat 30 H is a standard Economy Class seat that has extra legroom due to the position of the bulkhead, however proximity to the lavatory and galleys may be bothersome. The tray table is in the armrest, making the armrest immovable and slightly reducing the seat width. There is no floor storage during takeoff and landing. This is a bassinet position, so passengers with infants are often seated here. 30 J None No Power Seat 30 J is a standard Economy Class seat that has extra legroom due to the position of the bulkhead, however proximity to the lavatory and galleys may be bothersome. The tray table is in the armrest, making the armrest immovable and slightly reducing the seat width. There is no floor storage during takeoff and landing. This is a bassinet position, so passengers with infants are often seated here. 30 K None No Power Seat 30 K is a standard Economy Class seat that has extra legroom due to the position of the bulkhead, however proximity to the lavatory and galleys may be bothersome. The tray table is in the armrest, making the armrest immovable and slightly reducing the seat width. There is no floor storage during takeoff and landing. This is a bassinet position, so passengers with infants are often seated here. 40 D None No Power Seat 40 D is a standard Economy Class seat whose proximity to the lavatories may be bothersome. 40 E None No Power Seat 40 E is a standard Economy Class seat whose proximity to the lavatories may be bothersome. 40 F None No Power Seat 40 F is a standard Economy Class seat whose proximity to the lavatories may be bothersome. 40 G None No Power Seat 40 G is a standard Economy Class seat whose proximity to the lavatories may be bothersome. 41 A None No Power Seat 41 A is a standard Economy Class seat whose proximity to the lavatories may be bothersome. 41 B None No Power Seat 41 B is a standard Economy Class seat whose proximity to the lavatories may be bothersome. 41 C None No Power Seat 41 C is a standard Economy Class seat whose proximity to the lavatories may be bothersome. 41 H None No Power Seat 41 H is a standard Economy Class seat whose proximity to the lavatories may be bothersome. 41 J None No Power Seat 41 J is a standard Economy Class seat whose proximity to the lavatories may be bothersome. 41 K None No Power Seat 41 K is a standard Economy Class seat whose proximity to the lavatories may be bothersome. 42 A None No Power Seat 42 A is a standard Economy Class seat that may have extra legroom due to the exit however, the protrusion of the exit door may be bothersome. The proximity to the lavatories may be bothersome. There is no floor storage during takeoff and landing. 42 B None No Power Seat 42 B is a standard Economy Class seat that may have extra legroom due to the exit however, the proximity to the lavatories may be bothersome. There is no floor storage during takeoff and landing. 42 C None No Power Seat 42 C is a standard Economy Class seat that may have extra legroom due to the exit however, the proximity to the lavatories may be bothersome. There is no floor storage during takeoff and landing. 42 D None No Power Seat 42 D is a standard Economy Class seat that may have extra legroom due to the position of the bulkhead however, the proximity to the lavatories may be bothersome. There is no floor storage during takeoff and landing. 42 E None No Power Seat 42 E is a standard Economy Class seat that may have extra legroom due to the position of the bulkhead however, the proximity to the lavatories may be bothersome. There is no floor storage during takeoff and landing. 42 F None No Power Seat 42 F is a standard Economy Class seat that may have extra legroom due to the position of the bulkhead however, the proximity to the lavatories may be bothersome. There is no floor storage during takeoff and landing. 42 G None No Power Seat 42 G is a standard Economy Class seat that may have extra legroom due to the position of the bulkhead however, the proximity to the lavatories may be bothersome. There is no floor storage during takeoff and landing. 42 H None No Power Seat 42 H is a standard Economy Class seat that may have extra legroom due to the exit however, the proximity to the lavatories may be bothersome. There is no floor storage during takeoff and landing. 42 J None No Power Seat 42 J is a standard Economy Class seat that may have extra legroom due to the exit however, the proximity to the lavatories may be bothersome. There is no floor storage during takeoff and landing. 42 K None No Power Seat 42 K is a standard Economy Class seat that may have extra legroom due to the exit however, the protrusion of the exit door may be bothersome. The proximity to the lavatories may be bothersome. There is no floor storage during takeoff and landing. 45 D None No Power Seat 45 D is a standard Economy Class seat however, other flyers tend to bump into this seat. 47 D None No Power Seat 47 D is a standard Economy Class seat with extra legroom since there is no seat directly in front of it. The seat ahead is missing as there is an escape hatch in the floor. This hatch is for the crew rest which is beneath the main deck. 50 D None No Power Seat 50 D is a standard Economy Class seat whose proximity to the galley may be bothersome. 50 E None No Power Seat 50 E is a standard Economy Class seat whose proximity to the galley may be bothersome. 50 F None No Power Seat 50 F is a standard Economy Class seat whose proximity to the galley may be bothersome. 50 G None No Power Seat 50 G is a standard Economy Class seat whose proximity to the galley may be bothersome. 51 A None No Power Seat 51 A is a standard Economy Class seat whose proximity to the galley may be bothersome. 51 B None No Power Seat 51 B is a standard Economy Class seat whose proximity to the galley may be bothersome. 51 C None No Power Seat 51 C is a standard Economy Class seat whose proximity to the galley may be bothersome. 51 H None No Power Seat 51 H is a standard Economy Class seat whose proximity to the galley may be bothersome. 51 J None No Power Seat 51 J is a standard Economy Class seat whose proximity to the galley may be bothersome. 51 K None No Power Seat 51 K is a standard Economy Class seat whose proximity to the galley may be bothersome. 52 A None No Power Seat 52 A is a standard Economy Class seat with extra legroom, but some of the space is impeded by the slide that protrudes from the exit door. Proximity to the galley can be bothersome. The tray table is in the armrest, making the armrest immovable and slightly reducing seat width. There is no floor storage for this seat during takeoff and landing. It can get cold by the exits during flight. 52 B None No Power Seat 52 B is a standard Economy Class seat with extra legroom due to the Emergency Exit. Proximity to the galley may be bothersome as passengers tend to congregate in this area. The tray table is in the armrest, making the armrest immovable and slightly reducing seat width. There is no floor storage during takeoff and landing. 52 C None No Power Seat 52 C is a standard Economy Class seat with extra legroom due to the Emergency Exit. Proximity to the galley may be bothersome as passengers tend to congregate in this area. The tray table is in the armrest, making the armrest immovable and slightly reducing seat width. There is no floor storage during takeoff and landing. 52 D None No Power Seat 52 D is a standard Economy Class seat with extra legroom due to the position of the bulkhead. Proximity to the galley may be bothersome as passengers tend to congregate in this area. The tray table is in the armrest, making the armrest immovable and slightly reducing seat width. There is no floor storage during takeoff and landing. 52 E None No Power Seat 52 E is a standard Economy Class seat with extra legroom due to the position of the bulkhead. Proximity to the galley may be bothersome as passengers tend to congregate in this area. The tray table is in the armrest, making the armrest immovable and slightly reducing seat width. There is no floor storage during takeoff and landing. 52 F None No Power Seat 52 F is a standard Economy Class seat with extra legroom due to the position of the bulkhead. Proximity to the galley may be bothersome as passengers tend to congregate in this area. The tray table is in the armrest, making the armrest immovable and slightly reducing seat width. There is no floor storage during takeoff and landing. 52 G None No Power Seat 52 G is a standard Economy Class seat with extra legroom due to the position of the bulkhead. Proximity to the galley may be bothersome as passengers tend to congregate in this area. The tray table is in the armrest, making the armrest immovable and slightly reducing seat width. There is no floor storage during takeoff and landing. 52 H None No Power Seat 52 H is a standard Economy Class seat with extra legroom due to the Emergency Exit. Proximity to the galley may be bothersome as passengers tend to congregate in this area. The tray table is in the armrest, making the armrest immovable and slightly reducing seat width. There is no floor storage during takeoff and landing. 52 J None No Power Seat 52 J is a standard Economy Class seat with extra legroom due to the Emergency Exit. Proximity to the galley may be bothersome as passengers tend to congregate in this area. The tray table is in the armrest, making the armrest immovable and slightly reducing seat width. There is no floor storage during takeoff and landing. 52 K None No Power Seat 52 K is a standard Economy Class seat with extra legroom, but some of the space is impeded by the slide that protrudes from the exit door. Proximity to the galley can be bothersome. The tray table is in the armrest, making the armrest immovable and slightly reducing seat width. There is no floor storage for this seat during takeoff and landing. It can get cold by the exits during flight. 58 D None No Power Seat 58 D is a standard Economy Class seat however, the proximity to the lavatory and galley may be bothersome. 58 E None No Power Seat 58 E is a standard Economy Class seat however, the proximity to the lavatory and galley may be bothersome. 58 F None No Power Seat 58 F is a standard Economy Class seat however, the proximity to the lavatory and galley may be bothersome. 58 G None No Power Seat 58 G is a standard Economy Class seat however, the proximity to the lavatory and galley may be bothersome. 59 A None No Power Seat 59 A is a standard Economy Class seat in the last row of the aircraft and may not recline. Proximity to the lavatory and galley may be bothersome. 59 B None No Power Seat 59 B is a standard Economy Class seat in the last row of the aircraft and may not recline. Proximity to the lavatory and galley may be bothersome. 59 C None No Power Seat 59 C is a standard Economy Class seat in the last row of the aircraft and may not recline. Proximity to the lavatory and galley may be bothersome. 59 H None No Power Seat 59 H is a standard Economy Class seat in the last row of the aircraft and may not recline. Proximity to the lavatory and galley may be bothersome. 59 J None No Power Seat 59 J is a standard Economy Class seat in the last row of the aircraft and may not recline. Proximity to the lavatory and galley may be bothersome. 59 K None No Power Seat 59 K is a standard Economy Class seat in the last row of the aircraft and may not recline. Proximity to the lavatory and galley may be bothersome. 7 A None No Power Seat 7 A is a standard Prestige Class flat bed seat. There is no floor storage during takeoff and landing. This is a bassinet position so passengers with infants are often seated here. Proximity to the lavatory and stairs may be bothersome. 7 B None No Power Seat 7 B is a standard Prestige Class flat bed seat. There is no floor storage during takeoff and landing. This is a bassinet position so passengers with infants are often seated here. Proximity to the lavatory and stairs may be bothersome. 7 D None No Power Seat 7 D is a standard Prestige Class flat bed seat. There is no floor storage during takeoff and landing. This is a bassinet position so passengers with infants are often seated here. Proximity to the lavatory and stairs may be bothersome. 7 E None No Power Seat 7 E is a standard Prestige Class flat bed seat. There is no floor storage during takeoff and landing. This is a bassinet position so passengers with infants are often seated here. Proximity to the lavatory and stairs may be bothersome. 7 G None No Power Seat 7 G is a standard Prestige Class flat bed seat. There is no floor storage during takeoff and landing. This is a bassinet position so passengers with infants are often seated here. Proximity to the lavatory and stairs may be bothersome. 7 H None No Power Seat 7 H is a standard Prestige Class flat bed seat. There is no floor storage during takeoff and landing. This is a bassinet position so passengers with infants are often seated here. Proximity to the lavatory and stairs may be bothersome. All First and Prestige Class seats have access to AC power ports. In Economy, power ports are shared between seats. Korean Air's A380-800 aircraft is the largest in the airline's fleet. It is equipped with 399 seats spread over 2 floors and offers three classes of service: First, Prestige, and Economy. First Class seats are open Kosmo suite flat bed seats. All Prestige seats are located on the upper deck and are Prestige Sleeper flat bed seats. Although these seats are designated as flat-bed seats that recline 180 degrees, passengers have found the seat backs do not seem to recline fully parallel to the floor. Passengers often complain about this plane getting hot and stuffy as you are unable to direct or adjust the air vents on this aircraft. The following rows may be used as reference: First Class are rows 1-3; Prestige Class are rows 7-23; and Economy is 28-59. Compare to the new suite firstclass, the seat is outdated but excellent seat. Quiet and no bother from the toilet (it is in the other side). Has two usb ports and one power outlet. KE 081 ICN to JFK seat 1A. After flying to ICN in the 747, the A380 was a let down. The seats are smaller and narrower. There is nowhere near the privacy, even with the barrier raised. There are twelve seats in F, which was full and felt crowded. Yes, the service and food were very good, and yes, the A380 is a wonderfully quiet and smooth flying plane. But in the future, given a choice, I'll fly the 747-8i. After KAL unexpectedly subbed a 777 for the outward leg I was looking forward even more to the A380 back to London from Korea, This Prestige product, first tried in a 777 in 2010, is showing its age, particularly in layout but, with the entire top deck all-business, the centre pair (rather than three) seats are both aisle access so you only have to climb out over stretched out sleeping fellow passengers if you choose a window seat on a crowded flight. Seat itself appars to differ from the 777 unit only in detail (extra USB port below the reading light) and is comfy enough with plenty of adjustment but backrest support is poor. At 5'6" i could stretch right out for sleeping and the almost-flat mattress is wide enough, just, for sleeping. Storage space is poor. Bins unuseable for takeoff/landing in the seatback in front are too far a reach and the one accessible cubby - about where your hip is - is too small and open and you risk dropping slim items like a phone or passport down into the seat mechanism. A decent, lidded bin that opens from the top and can take a laptop would be better. Mains power points in the base between each pair of seats could be higher and would be handier ajacent the USB plugs. IFE is passable but the choice of entertainment is no match for the huge Emirates library. Western menu from London was excellent but poor from Seoul - tasteless fish and undercooked veges served barely lukewarm for lunch. Drinks service and offering was not as thorough but there is a small self-service bar at the front by the loos and a service bar in the back, both with uncomfortable couches to sit on. It's annoying if you are temporarily away from your seat, you miss out on amenity kit/headphones (good noise cancel type) when the attendant comes past - they know which seats are occupied so why not just leave the item on the seat as they pass? If children are in row 11, I'd sit way further back than 12, or choose the small forward cabin though there is a lot of aisle traffic accessing toilets. About midway between bar and bassinet row seemed ideal. 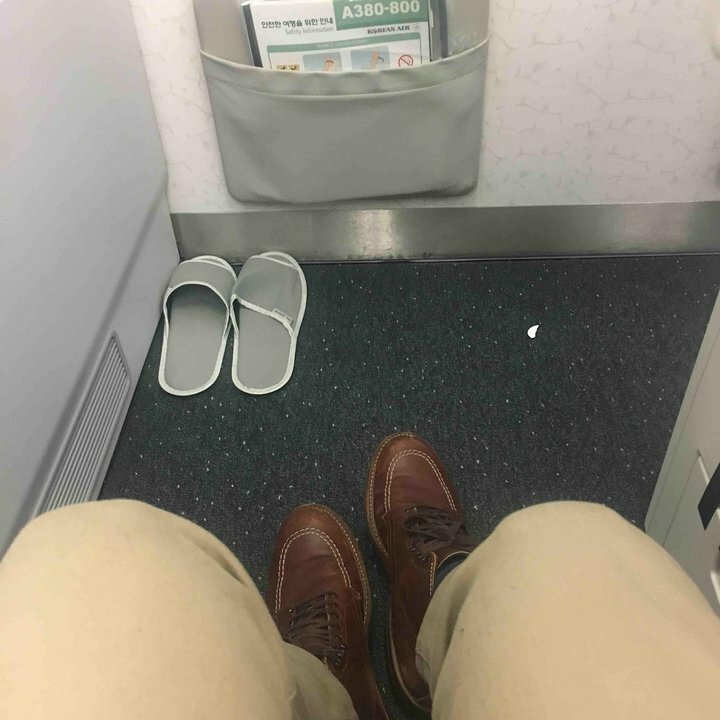 Overall, still an acceptable business class seat but a long way from the top - Korean now has all-aisle access on some newer planes and similar ANA and Emirates all-aisle seats are much better. Korean Air flies 1 versions of Airbus A380-800 (388).